Breathe in, then out quickly through your nose, maybe 20 times in succession, try not to get too dizzy. Then put on some cool world music and take up position. Kuliandingy is a new yoga sensation that is taking off in Europe and we here in Thailand, are lucky to have a volunteer teacher of this practice, Ingrid from the Netherlands, to take classes for us every evening. 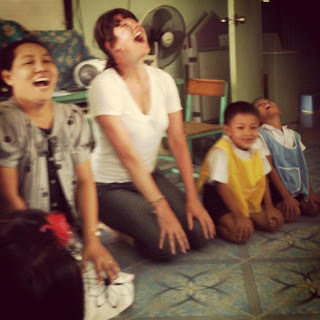 Ingrid is on a two week program teaching yoga and English to the children of ourKuraburi Junior School, located just outside the town. The Director of the school is so pleased to be part of this program, believing that it will focus and energize her students to learn; not just about English, but exercise and yoga and open their minds to new ways of doing things. The two weeks have been a pleasure to spend with Ingrid and she will be pleased to know that we are continuing her workshop in Shiori’s and Jennifer’s house, despite the return of the rain. We are always looking for volunteers with different skills to take part in the school andLearning Center projects. The placements are not just for teaching English, but exercise, dance, arts and crafts, computers, the list is endless, If you feel you have something to share please do get in touch. Namaste.